What is the difference between “work account” and “Microsoft account”? Work account is an account created by an organization’s administrator to enable a member of the organization access to all Microsoft cloud services such as Microsoft Azure, Microsoft Intune or Office 365. A work account can take the form of a user’s work email address, such as username@orgname.com, when an organization federates or synchronizes its Active Directory accounts with Azure Active Directory. To learn about the process of administering work accounts by the organization’s administrator please refer to What is the process to administer work accounts to eligible organizational members?. Microsoft account, created by user for personal use, is the new name for what used to be called “Windows Live ID”. The Microsoft account is the combination of an email address and a password that a user uses to sign in to all consumer-oriented Microsoft products and cloud services such as Outlook (Hotmail), Messenger, OneDrive, MSN, Windows Phone or Xbox LIVE. If a user uses an email address and password to sign in to these or other services, then the user already has a Microsoft account—but the user can also sign up for a new one at any time. Can I use a work account with my Visual Studio subscription? 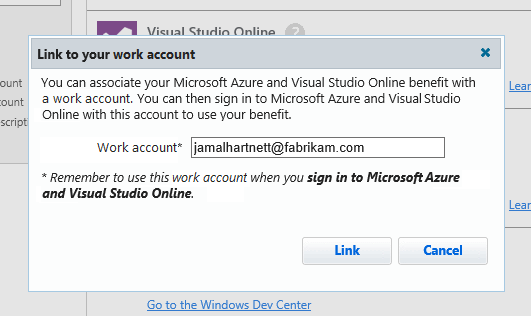 You must use a Microsoft account to activate your Visual Studio subscription, but you can then link your benefits to your work account through the My Account portal. You get the same level of benefits whether you use a work account or a Microsoft account. What are the benefits of using a work account with Microsoft Azure? Organizations with Visual Studio subscriptions who need the flexibility to transfer Microsoft Azure benefits between different employees of the same organization. This is relevant for organizations that are concerned that an MSDN subscriber in their organization creating Microsoft Azure assets under a Microsoft account could cause undue business risk when the person associated with that Microsoft account leaves the company. Transferring the Microsoft Azure benefits to a different individual requires that individual also have an MSDN license associated to them. Who is able to use a work account for Microsoft Azure? New or existing Visual Studio subscriber who have not yet activated their Microsoft Azure MSDN benefit can activate it using a work account via the My Account portal. If you’ve already activated your Microsoft Azure benefit and would like to transfer the subscription from your Microsoft account to your work account, contact Microsoft Azure Customer Support. What is the process to administer work accounts to eligible organizational members? The administrator signs up as an organization to a Microsoft cloud service such as Microsoft Azure, Microsoft Intune or Office 365. A cloud based tenant is provisioned automatically in Azure Active Directory to represent the organization. Once this tenant has been provisioned, the administrator issues work accounts to each one of its members. 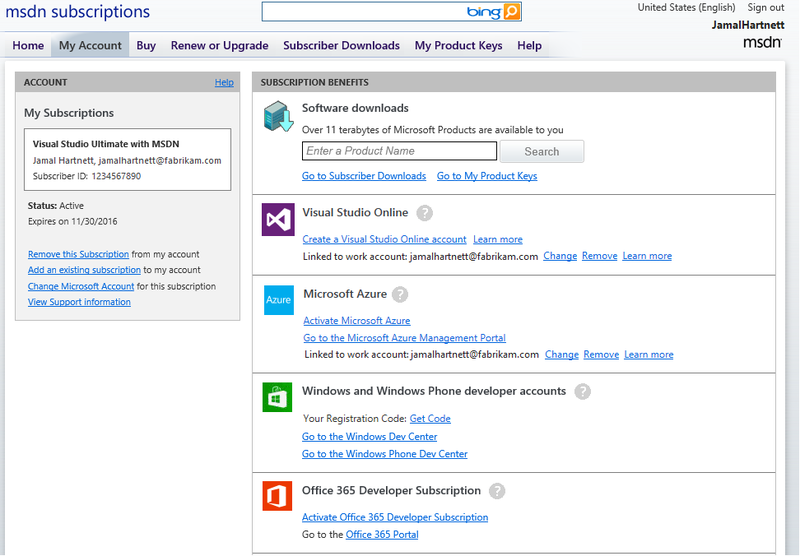 How can eligible Visual Studio subscribers create an MSDN Microsoft Azure subscription with their work account? Navigate to My Account (you’ll be prompted to sign in with your Microsoft account). 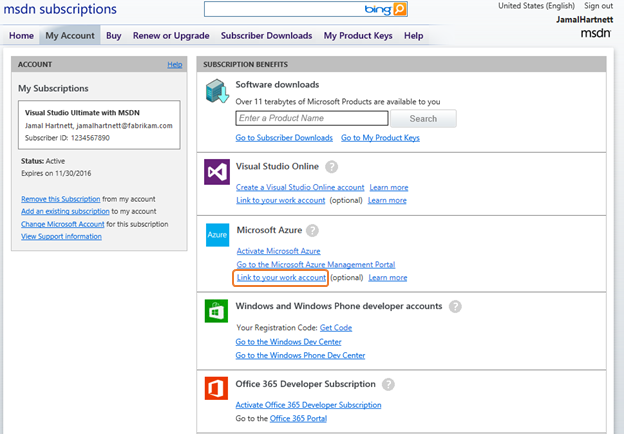 In “Subscription Benefits” under “Microsoft Azure”, choose “Link to your work account”. Enter a work account (e.g. username@orgname.com) and select “Link”. Choose “Activate Microsoft Azure” and sign in with your work account. When is the work account associated with the Microsoft Azure benefit? The work account is activated once the user successfully completes the steps described in the answer of “How can eligible Visual Studio subscribers create an MSDN Microsoft Azure subscription?”. This validates the work account and ensures that the user accessing the benefit is the person who has been granted the benefit. How can an organization transfer ownership of the benefits and resources associated with an employee’s Microsoft Azure work account after the employee has left the organization? When an employee leaves an organization and the associated account is removed from Azure Active Directory, the user’s work account is automatically disabled. If you’d like to transfer the assets under this disabled MSDN Azure subscription to another Visual Studio subscriber within your organization, then the organization administrator can contact Microsoft Azure Customer Support to transfer ownership of the disabled account. Note: Disabling a user's work account does not cancel their Visual Studio subscription. To remove the MSDN subscription of an employee who leaves the organization, see Volume Licensing Administration Help. How can organizations enforce their employees to activate their Microsoft Azure using their work accounts rather than their Microsoft accounts? Organizations should implement a clear policy requiring Visual Studio subscribers use their work accounts. How do I prevent employees from activating their Microsoft Azure benefits with their Microsoft accounts and not linked to a work account? With clear policy and guidance, organizations can reduce the likelihood of this happening, but they cannot prevent it completely.